Locking grace period (days): Choose the number of days after the last shift of the schedule has been worked that the schedule will be locked. Providers with unconfirmed shifts will be sent daily email reminders until that time. Locking of schedules can now be set up to 60 days after the end of the schedules. Default request availability to providers past the schedule end date (months): Designate the length of time after a schedule request has been completed that the schedule request will be retained in ByteBloc. 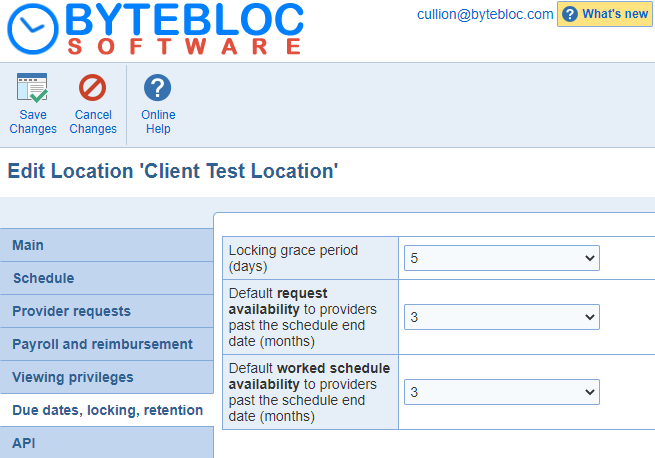 Default worked schedule availability to providers past the schedule end date (months): Select the length of time after a schedule has been completed that the schedule information will be retained in ByteBloc.